Christian Zanési - Grand Bruit / Stop! l'horizon. Vinyl LP. Bleep. 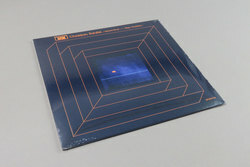 Cold mission electronics from Mego's invaluable GRM reissue program, these two Christian Zanési pieces from 1991 and 1983 respectively carry the sort of hollowed out fear of the unknown that stalks the very best science-fiction. Grand Bruit is a blizzard of calculated electroacoustic electronics and mangled up voices in a rather (Florian) Hecker style. Yet the overarching sense of anxiety throughout aligns it with the darkest strains of techno, grime and techstep drum & bass. Stop ! l'horizon meanwhile sees the icy atmospheres extending even further into an endless oblivion of magnetic structures that collapse in on themselves repeatedly. The claustrophobic feeling is mirrored by the killer sleeve design, a UFO radar blip with an icy atmosphere, framed in the usual GRM/Mego frame.